ROMANTIC TIMES said, Amanda Ashley is a masterful storyteller. This novel is so rich in sensuality and imagery that readers will be entranced by this haunting tale of a vampire who finds love too late and the woman who may save him from the darkness. This is one keeper to put alongside Maggie Shayne and Linda Lael Miller. Once again Amanda Ashley delivers one of the classic vampire romance novels that she is famous for. Passionately intense and heart-stoppingly tender this novel has everything that a vampire novel should have – the tortured hero and the heroine brave enough to put her fears aside and love him for the man he was and subdue the monster within. 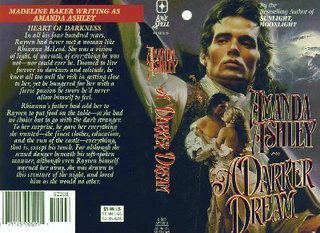 HARRIET KLAUSNER said A DARKER DREAM is a dream of a vampire romance that will enchant fans of the sub-genre. The lead characters and their evolving relationship are filled with passion and reality, a rare combination in supernatural fiction. Amanda Ashley is so convincing in her premise that vampires are real beings suffering from an ailment that mortal love will cure, that readers will conclude that DNA testing would prove that they are part of a species very similar to our own. This novel is a great supernatural romance due to the characters' love for each other and their willingness to sacrifice, even their lives, for their cherished partner. In all his four hundred years, Rayven had never met a woman like Rhianna McLeod. She was a vision of light, of warmth, of everything he was not - nor could ever be. Doomed to live forever in darkness and solitude, he knew all too well the risk in getting close to her, yet he hungered for her with a fierce passion he swore he’d never allow himself to feel. Rhianna’s father had sold her to Rayven to put food on the table -so she had no choice but to go with the dark stranger. To her surprise, he gave her everything she wanted -the finest clothes, education, and the run of the castle - everything, that is, except his touch. For although she sensed danger beneath his soft-spoken manner, although even Rayven himself warned her away, she was drawn to this creature of the night, and loved him as she would no other. He had always loved the night. His favorite pastimes - drinking, gambling, the pursuit of a beautiful woman - were best accomplished in the hours of darkness. The best times of his life had been spent in dimly-lit saloons and smoky gambling dens, or in lush candlelit bedrooms. But that had been long ago. Only now did he fully understand what he had lost when the light had been taken from him. Because she was like the sun - bright, warm, beautiful. And, like the sun, she could never be his. forever imprisoned by the night. Rayven sat back in his chair, trying unsuccessfully to mask his disgust as he watched Vincent McLeod attempt to auction off the eldest of his five daughters. Head down, hands limp at her sides, the girl stood mute, like a beast bound for slaughter. Her hair, a dull dirty blond, tumbled over her shoulders, hiding her face as effectively as the shapeless gray dress hid the body beneath. "See here, Rayven," Montroy complained. "Can't we have a little more light?" Rayven shook his head. The room was dark, and he liked it that way - dark wood paneled the walls, a dark green carpet covered the floor, matching draperies hung at the windows, the lamps were turned low, as always. Anyone who shared the back room of Cotyer's Tavern with him knew he avoided bright light. It was one of his many quirks, one the rich young men of the town endured for the sake of being in his rather questionable company. "Well, if we can't turn up the lamps, then have the girl disrobe," Lord Tewksbury called from the back of the room. "I refuse to bid on a pig in a poke." "Aye," Nevel Jackson agreed, "tell the girl to peel off those rags so we can see what we're buying." The call was taken up around the room. Vincent McLeod hesitated, then whispered something to the girl. Head still bowed, she began to unlace the bodice of her dress. Rayven watched through narrowed eyes, noticing the way the girl's hands trembled as she unfastened the shabby frock. Though he could not see her face, he knew her cheeks were flushed with embarrassment, knew her heart was pounding like that of a fawn caught in the jaws of a wolf. "Enough." Just one word, softly spoken, but it carried throughout the room. "See here, Rayven," Tewksbury protested. "I think..."
Rayven silenced him with a quelling glance. "The girl is mine," he declared, having decided, in that moment, to buy her, though he still had not seen her face. "Seeking a new mistress?" Lord Montroy inquired. Rayven met Montroy's gaze. Dallon Montroy was a tall, good-looking man, almost as wealthy as Rayven himself. Of all the men Rayven gambled with, Montroy came closest to being a friend. Ignoring the viscount's question, Rayven waved to the old man. "Bring her here." "Aye, milord." Hastily, Vincent McLeod grabbed his daughter by the arm and dragged her across the room. "You won't be disappointed, milord. She'll serve you well." "Yes," Rayven murmured. "She will, indeed." Reaching into his pocket, Rayven brought out a handful of bank notes and thrust them at the other man. "Has she a name?" "Of course, my lord. It's Rhianna, but she'll answer to anything you wish to call her." "You know where I live?" "Aye, sir." Everyone knew of Rayven's castle. Located on top of Devil Tree Mountain, it stood like a sentinel over the town, tall, dark, and imposing, like its master. "Take her there. My man will look after her." Rayven waved his hand in a gesture of dismissal. Turning back to the game, he picked up his cards. "You lose again, Montroy," he drawled softly, and spread his hand on the table. Dallon Montroy tossed his cards into the pot. "Seems to be your lucky night," he remarked good-naturedly. Rayven grunted softly. "Perhaps you're right," he mused as he shuffled the cards and dealt a new hand. "Perhaps you're right." I finished this book last night and I must say that it’s my favorite of Amanda Ashley’s yet! To be entirely honest, I find myself liking her works more and more with each book I read. Her characters are eloquently written and the situations are very imaginative. The language is beautiful and I devour her books! The author has a way of keeping to the traditional (almost Bram Stoker-like) vampire while maintaining her own flair. However, this plot was similar to that of Embrace the Night and—though I can’t really describe it—a few of the descriptions reminded me of her short story “Darkfest”. Though, this story still had its own color that kept me riveted. In fact, the book had several poems in it and one of them (the one that is broken up into 6 sections and begins the first 6 chapters) is my favorite!!! This is the first novel that I have read by Amanda Ashley. It starts off with a poor father who tries to make some extra money for his family by selling his eldest daughter at a gambling club. One of the rich men there is Lord Rayven who is a vampyre and out of pity buys her. The story is set in Victorian times, and the way the characters interact with each other is also true to those times. Rayven and Rhianna fall in love and the whole book is them struggling to be together. If you're looking for something modern then this book is not for you. If you want to read a classic vampyre tale then I recommend you read this book. I did not see the ending coming. I was really pleased at how it ended. I really enjoyed it. In some ways it reminded me of "Dracula" by Bram Stoker, but only in that it is a classic vampyre tale. I was shopping in the store....and as I passed the book section, I spotted Mandy's book! I couldn't pass it up so, of course, I bought it, adding to my ever-growing collection of Amanda Ashley novels. The thing that I liked most about this story was its historical fiction outlook. Something about former centuries lifestyles eats up my curiousity. Which is what makes this novel good, the subtle vampyrism is just the foundation of the story. It revolves more around the times and the relationship between Rhianna & Rayven than it does on vampyrism. Rayven's compassion to save Rhianna from public embarassment is just the beginning of proof that he is not the monster he thinks of himself. He provides her with a life of any and every thing she could ever want, and even things she couldn't imagine! Bevins' loyalty is the counterpart of Rayven's compassion. A human who would do anything for the man, or shall I say, vampyre who saved his life. You constantly read about male vampires, but I was so happy to read, even briefly, Mandy's female vamp, Lysandra, Rayven's sire. Just as I was contemplating the relationship of cat and mouse between Rayven and Rhianna....Amanda writes those exact words! Of all Mandy's vamps I've read about, Rayven seems to have the most trouble coming to terms with who and what he is....The ending was something I have hoped to read from so many vampire novels over the years, and I was finally given it!